Well hello, my name’s Tracy. 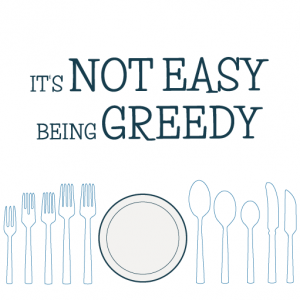 I used to write a food blog called ‘It’s not easy being greedy‘, and then I had a baby who basically stole all my time, and suddenly week 23 turns into week 35 and I’ve finally got five minutes to try and update my little bit of space on the internet, argggghhhhhhhh. I am typing quietly though (while stuffing chocolate into my face … who knew one could eat a family sized Galaxy caramel in literally one minute?) as it looks like he is going to wake up any second now. So what’s been going on with me? Well, I had a birthday, Ioan started nursery, Andrew had a birthday, I returned to work, Ioan had a birthday, we’ve all been pretty constantly sick (that killer cough that started in June? 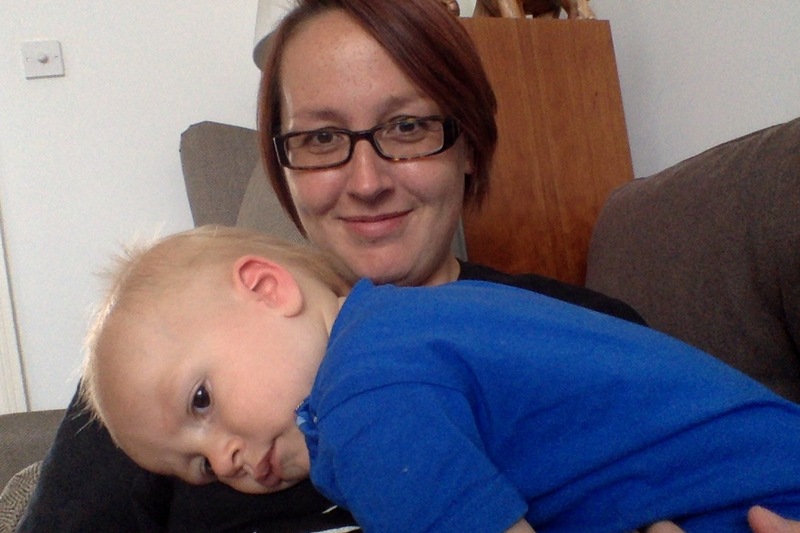 Well, it’s finally getting better now …) thanks to Ioan and his little buddies at nursery, and we’ve been on holiday. 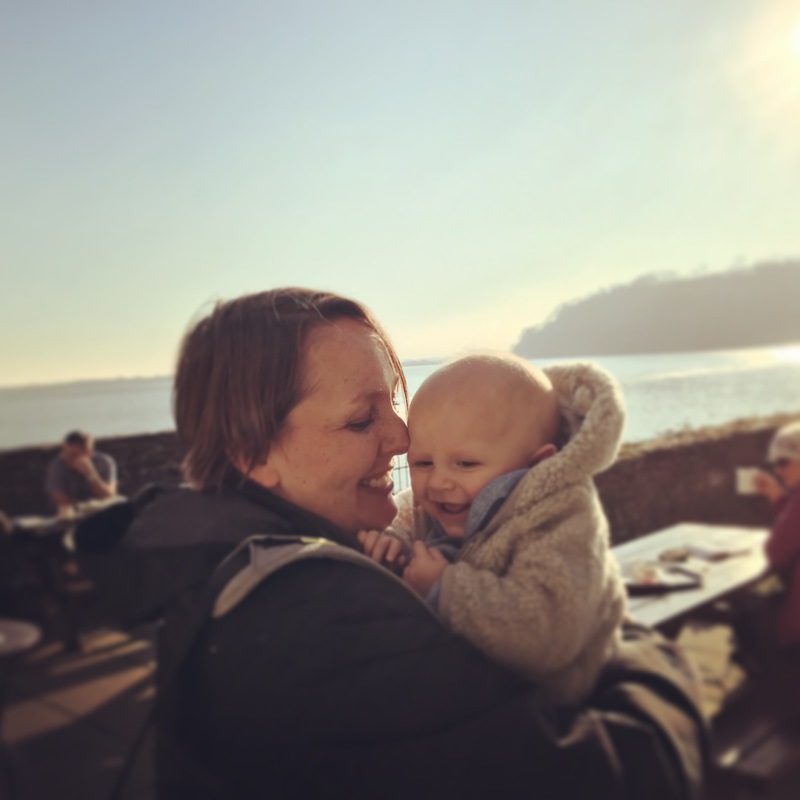 Every time I think I might have five minutes to sit and blog, there ends up being something else I have to do and it gets pushed to another day, which has only just come around. 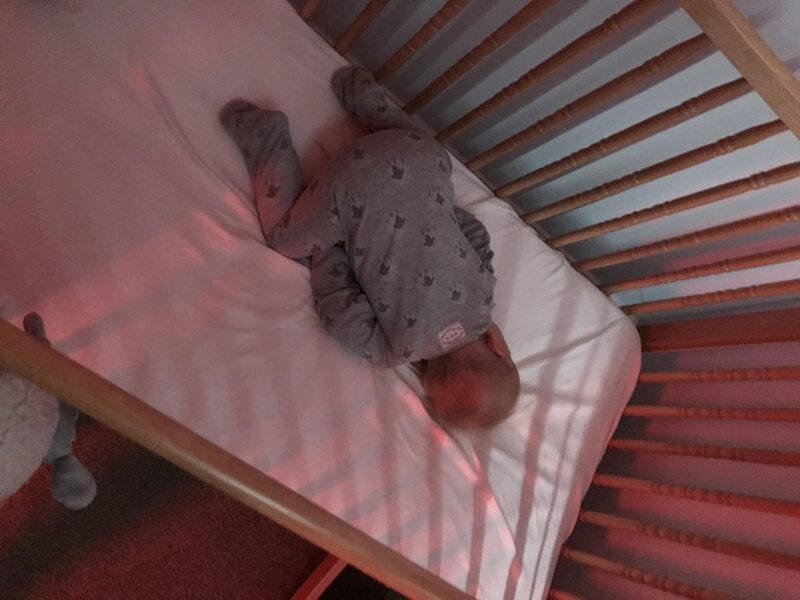 Now, considering my baby doesn’t sleep, you would have thought I would have plenty of time on my hands, but I just spend that time feeling sorry for myself that my baby doesn’t sleep. Okay, it’s not that he doesn’t sleep, it’s just that he sleeps for one or two hours at a time and then wakes up screaming for cuddles, a feed, a comforting pat on the bum, or just to show me how he doesn’t really need to sleep and can be completely wide awake at 2am (for bloody hours) when I have work in a few hours. It’s not easy, nor is it made easier by well meaning comments such as “he should be sleeping through the night by now”. Yes, maybe he should, but he doesn’t. Argggggghhhhhhhhh. But do you know what, it’s amazing what a three hour stretch of sleep can do to you, and it actually does make me feel rested. And, even more alarmingly, I can apparently function as a working professional on pretty much no sleep (or I am kidding myself and my colleagues are desperately wondering how to tell me that I am worse than useless, and praying I get sacked soon). Andrew, bless him, does try and stay awake to provide moral support when Ioan is being particularly challenging, but as Ioan is still breastfeeding, Andrew is lacking some fundamental anatomical attributes which mean Ioan only wants me on many occasions! Can you see that the lack of sleep in my life is pre-occupying me? It is relevant for this food blog because it means my food choices are mainly based around sugar content and how quickly I can consume any item. The aforementioned family sized bar of chocolate does a good job as a meal replacement, as do crisps (although who am I kidding? I’ll eat the bar of chocolate and a meal). I know an apple or banana would also do a good job, but sorry, they just don’t cut the mustard at the moment. And I am often so disorganised that I haven’t bought shopping so that we have bananas in the house; nor have I cooked in advance so an easy meal is there and ready to go. BUT ALL THAT IS CHANGING TODAY, PEOPLE. Yes, for the first time in a very long time, I have prepared my week’s menu, and have spent some time today cooking in advance so I don’t have to rush home from work and make a full meal from scratch. This is much needed for many reasons. Firstly, evenings are more precious now as we have been at work, Ioan has been at nursery, and I want to catch up with him rather than spend an hour cooking dinner. Secondly, I have become too reliant on those convenient little food pouches to feed Ioan, as our meals are often basically too unhealthy for him, or too reliant on convenience food. Finally, I love planning meals, and cooking them, so I really would like to get this aspect of my life back as it is a way for me to decompress after a busy day (and sleepless night). 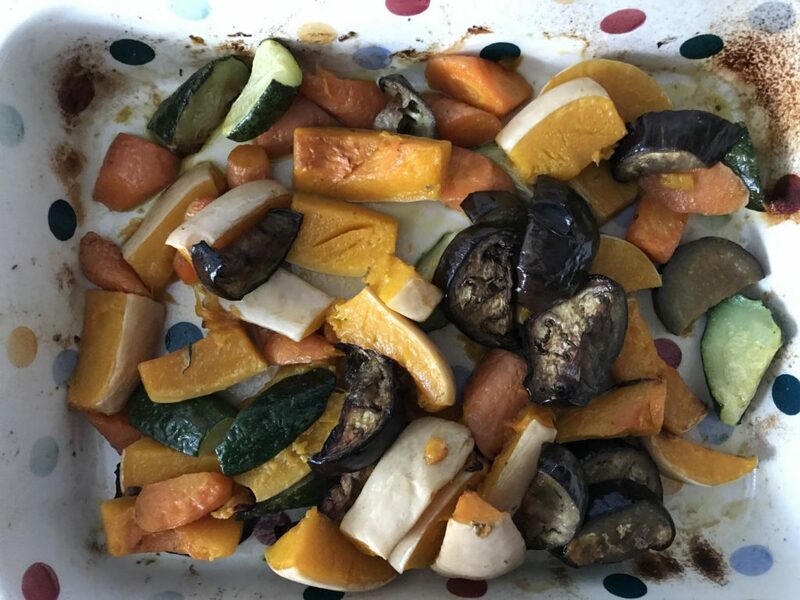 I have also roasted some butternut squash, aubergine, courgette and carrots to have with couscous for packed lunches this week. Go me. The next two weeks will be quite exceptional as I will be baking celebration cakes for a couple of occasions, so I need to be able to keep the oven free for baking. You may remember that I made a christening cake for Henry a few years ago? Well this week I’ll be making a cake for his little sister Evie (who Ioan thinks is his girlfriend following a date at the cinema). 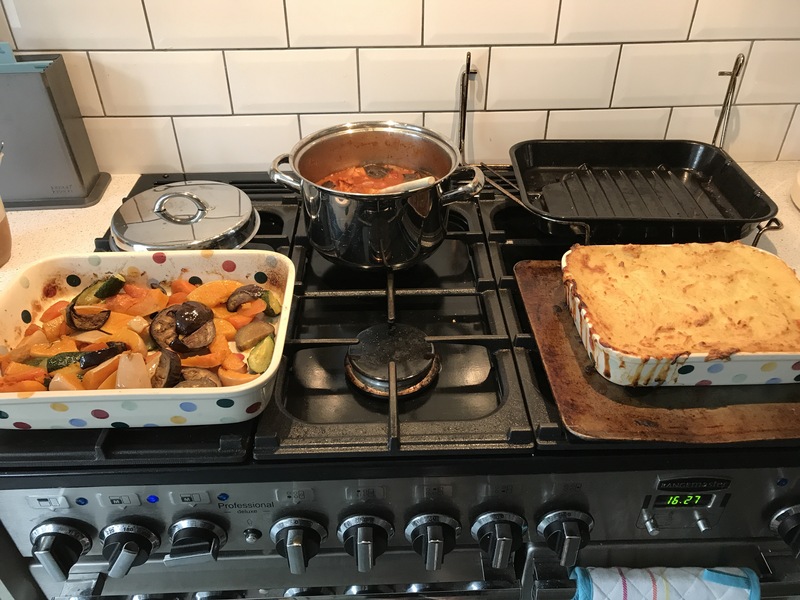 I am fortunate that I work from home on Thursdays (while Ioan is cared for by Granny Annie) and don’t work on Fridays as I have returned part time, so that gives me a bit of extra flexibility to cook fresh food towards the end of the week. So there we go – I have successfully managed to write a whole blog post, and it feels great. Apologies for the ‘lack of sleep’ rant (sadly, I suspect it will be a recurrent theme), but even typing these words feels therapeutic. 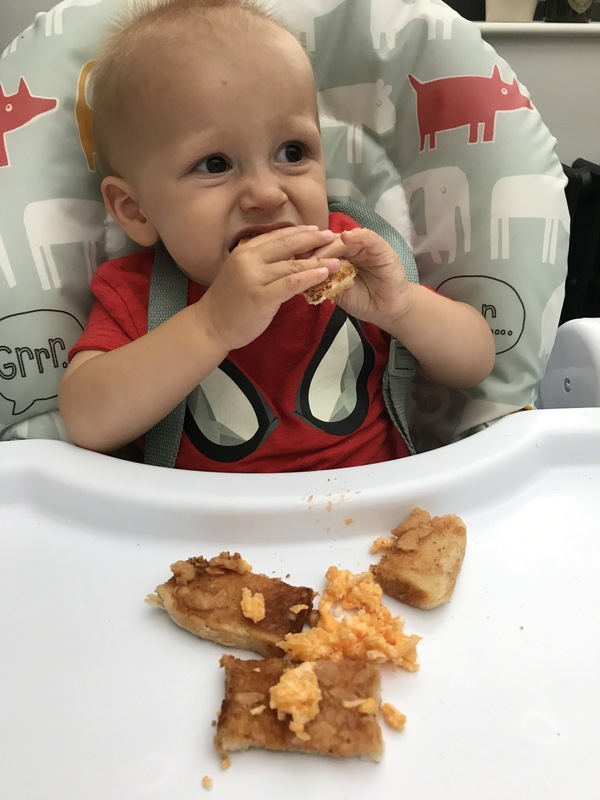 I am going to make the time to catch up with my monthly update on Ioan (I love documenting his progress and our lives, and hope he’ll enjoy reading it when he’s older), and share some fun foodie experiences we have had over the last few months. I think you are doing brilliantly, don’t be too hard on yourself, it’s not long since you returned to work. Even with no kids, I make all meals ahead. If you don’t mind eating the same thing twice, then my trick is to double up the weekend dinners and have Saturdays meal again on Monday, Sundays on Wednesday. The other two days don’t vary much, we have freezer to oven fish and chips on Tuesday and pasta on Thursday. I’m too tired to cook in the week, and himself is home before me so he heats up and does the veg. It may not suit your lifestyle but it saves me spending hours in the kitchen on a Sunday. Life’s too short! Thanks Janice, that’s so nice to hear, and what a great idea re doubling up too. Didn’t occur to me to have a day’s gap, dur!